Austin, Texas (AP) — Several years after thinking his Formula One career was over before it really even started, Brendon Hartley finds himself right back where he always dreamed he’d be: in the driver’s seat and ready to race. Hartley will make his F1 debut this weekend at the U.S. Grand Prix after a surprise call from Toro Rosso and a quick trip to Texas to meet the team. Hartley will be the first New Zealand driver in Formula One since Mike Thackwell at the 1984 Canadian Grand Prix. He got his chance to jump in the cockpit when Pierre Gasly returned to Japan for the Super Formula season finale. The Red Bull racing program had long known about Hartley and had signed him into their vaunted junior driver program as a shaggy-haired teenager in 2006. He won the Formula Renault championship, became a reserve driver and had his first F1 test by 18. But he couldn’t keep that success going and by 2010 he was dropped. He’s been very successful there as a World Endurance Championship winner in 2015 and a winner this year at Le Mans 24 hours. But when his Porsche team said it wasn’t going to race in the endurance series any more, Hartley, now 27, picked up the phone. 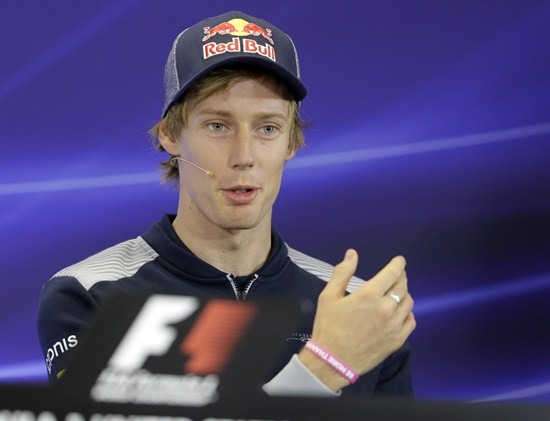 Hartley counts Red Bull’s Daniel Ricciardo among his best friends in racing and said he’s been asking him for advice. Ricciardo said he’s glad to see his friend back on the track. Hartley would seem to expect little in the way of results this weekend, but a good drive could actually complicate his future if it opens the door for more F1 possibilities. Hartley has been looking at a full-time seat in Indy Car with speculation he’d join Chip Ganassi Racing. “I was looking at IndyCar and I still am. Nothing confirmed for next season yet,” Hartley said.